Real Madrid captain Sergio Ramos has shown his nasty side once again with this nasty elbow on an opponent in tonight’s Champions League game. 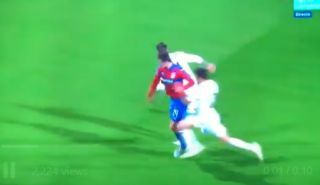 Los Blancos are winning away to Viktoria Plzen, but Ramos should surely have been shown a red card for this shocking challenge. Watch the video below as Ramos quite possibly goes in with a deliberate elbow, even glancing back at the referee to see if he’d got away with it. Pictures have also emerged online showing the Plzen player with a bloody nose from the Ramos challenge!